The big panel at Star Wars Celebration 2019 was more than just a stage for the Star Wars 9 trailer. That was just the end of an hour-long talk about what it means to conclude the forty-year saga. The stars of the new trilogy joined director J.J. Abrams and Lucasfilm president Kathleen Kennedy (along with their gleeful host Stephen Colbert) on stage, revealing some key new details and anecdotes about the upcoming film. After watching it all, we've broken out seven of the biggest things the panel revealed about Star Wars: The Rise of Skywalker. Nobody was willing to say specifically how much time passes between the end of Star Wars: The Last Jedi and the start of The Rise of Skywalker, just that it will be "some time". Daisy Ridley did tease that Rey has at least been able to put a dent in those huge Jedi books she took from Luke. In any case, it will definitely not be like The Last Jedi, which picked up immediately after the cliffhanger ending of The Force Awakens. "Emotionally, every day it hits me that she's not here," Abrams said at the panel. "But it's so surreal because we're working with her still." Princess Leia will return for the conclusion of the Star Wars saga, not as a different actress wearing a digital mask, but in the form of unused footage from Star Wars: The Force Awakens. 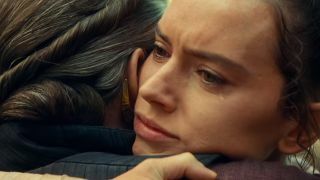 Abrams said it was a "weird miracle" being able to weave these cutting floor scenes into the story of The Rise of Skywalker, including some that feature Carrie Fisher alongside her daughter Billie Lourd. "This is an adventure that the group goes on together," J.J. Abrams announced to much applause. Despite having a clearly established trio of heroes, the new trilogy has barely ever put them all together in one room. Imagine if Han and Leia didn't formally meet until the end of The Empire Strikes back! We'll finally get to see Rey, Finn, and Poe all working together in The Rise of Skywalker. "One of the great things about the movie was the dynamic between the characters," Abrams added. "They are just the most wonderful together." Jannah, the new character played by Naomi Ackie, was finally made official at the panel. She looks like a young-but-grizzled resistance fighter, and she may have some lineage that we're already familiar with. Or not. Ever since the character first leaked out online, fans have been speculating that she's the daughter of Lando Calrissian. Hopefully they have more reason to think that than just the fact that Lando's the only black guy in Star Wars who wasn't either thrown from a window to his death or is too young to be her dad. But I digress - in any case, Ackie played it cool, saying that Lando's a pretty suave guy and he could have kids all over the universe for all she knows. Speaking of Lando, actor Billy Dee Williams couldn't help but address the rancor in the room. For years, he - not just the character, but Williams - has been personally accused of betraying his friend Han Solo to Darth Vader. "He was up against Darth Vader, he had to figure something out," Williams argued. "By the way, did anybody die? Nobody died, right? So I had to figure out how to prevent the complete demise of my friend and his friends." He makes a compelling argument. The blue lightsaber that was seemingly destroyed in Rey's fight against Snoke had a lot of history: it was constructed by Anakin Skywalker, reclaimed by Obi-Wan Kenobi, given to Luke Skywalker, lost along with Luke's hand on Cloud City, eventually found by Maz Kanata, given to Finn, and then finally ended up with Rey. Last we saw it was split in half by Rey and Kylo Ren's warring force powers, but she's apparently managed to reconstruct it - you can see it in proper working order in the trailer. It's been too long since we had a new droid to fawn over. And no offense to BB-8, but D-0 is just so… so small. I want to protect it. Also, the concept art for its creation proves that D-0's beautifully awkward wheeled design was inspired by a rubber duck. My heart can only take so much cute droid, and then they go and combine it with a beloved bathtime toy. Get outta here, Lucasfilm, I need a moment. There's a whole galaxy beyond Episode 9 - check out all the new Star Wars movies coming our way. And watch our recap of what's already gone down with the Ultimate Star Wars Timeline below.